Hadleigh Hall nursing home is a charming 19th century property set in landscaped gardens with excellent views across rolling Suffolk countryside. Our characterful home, situated on the edge of the historic market town of Hadleigh and just a short drive away from Ipswich and Sudbury, has been thoughtfully decorated and furnished with our residents in mind, providing a comfortable and homely living experience for 24 hour nursing, residential and dementia care. Explore the services provided at Hadleigh Hall, which are designed to make every resident’s stay a pleasant one. Looking for nursing homes in Ipswich area ? If you’re looking for a home that provides excellent care, support and comfort, with a busy activities schedule in which you’re free to choose whether to participate, then Hadleigh Hall nursing home is ideal. Providing first class care is at the heart of everything we do at Hadleigh Hall nursing home and we are passionate in our belief that residents should have the best possible quality of life. Our staff treat residents as they were their own family and at all times respect the fact they are individuals with their own needs and preferences. A diagnosis of dementia brings with it a very difficult and confusing time for the individual and their loved ones, and it is only natural to feel anxious about moving somewhere new. At Hadleigh Hall nursing home we ensure that the transition into our care is carefully assessed and managed in order to minimise upset to all concerned. Staying active has a beneficial effect on both the physical and mental wellbeing of our residents. The value we attach to this aspect of care is shown by the fact that our whole team is involved in actively engaging and stimulating our residents, not just our dedicated activities coordinator. We tempt people with a varied programme of activities and events, including visits by entertainers. Most importantly, we understand that everyone has different passions, hobbies and interests; our staff make every effort to really get to know our residents and their families so they know exactly what activities are dear to them - and then support them to carry on doing what they love. Hadleigh Hall nursing home offers exceptional residential and nursing care, specialised dementia care and end of life care. Respite care is also offered subject to availability. The home enjoys a peaceful rural setting but all the delights of the charming market town of Hadleigh are on its doorstep. Families will appreciate the easy access to Ipswich, Sudbury and wider areas of Suffolk and north Essex. The home is grand on the outside, and high-quality yet homely on the inside. It has plenty of light, comfortable communal areas and everything residents need to feel happy and content. Installed in the building are hoists, accessible bathing facilities, lifts, call bells and door alarms. All pressure care equipment is provided, including pressure mats and specialised mattresses. To obtain information about current availability, a person centred assessment or to simply arrange a visit, please do not hesitate to contact the home. We actively encourage those who are considering living at Hadleigh to visit and spend some time here to gain an accurate perception of the care we offer. You are invited to come for lunch or just for a look around. Staff members are around at all times of the day and they will be happy to give you a guided tour and answer your questions. If you would like a discussion with the manager, then a convenient appointment can be made. 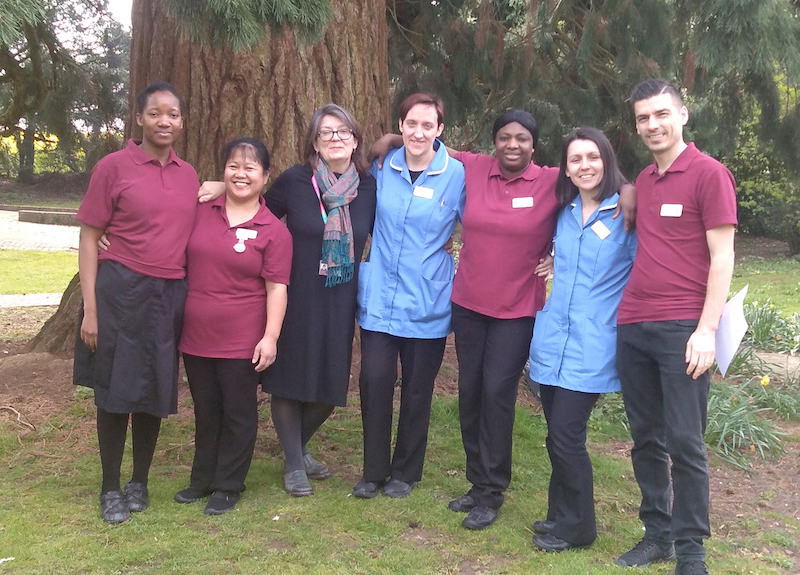 The care team at Hadleigh Hall are specifically selected to meet the criteria of a person centred worker, and undergo a continuous programme of training, on both practical and theoretical levels. Most of our training is facilitated by our own training arm, Kingsley Academy. There is a wonderful team at Hadleigh Hall. Not only do they go to great lengths in supporting one another on a daily basis, there is also great emphasise placed on providing good care and effective communication at the heart of everything they do.